Phosphates. The invisible common denominator behind many pool problems, like algae, elevated chlorine demand, and sometimes even cloudy water. Removing phosphates is the third of Orenda's Four Pillars of Proactive Pool Care. This third pillar is an easy one to master. The action step is simple: keep your water's phosphate levels as low as possible; ideally below 500 parts-per-billion (ppb). In this article, we will explain why phosphate removal is so beneficial and important, even if it's not always mandatory. Action Step: Keep phosphate levels as low as possible, ideally below 500 ppb. What are phosphates and where are they coming from? Without getting too technical, phosphates are the form of Phosphorus (P) that we most commonly find in pools. There are many different types of phosphates and phosphoric acids. There are too many variations to name, so let’s just simply refer to them all as “phosphates”. That being said, there is something you need to know. Test kits in the swimming pool business usually only test for orthophosphates, and may not pick up the other types. But in the presence oxidizers or sunlight (....so, every swimming pool we deal with), other types of phosphates can break down and convert into orthophosphates over time. In fact, it’s not uncommon to test phosphates, and the next day has a higher level. It’s complicated, but just know that it is possible to have higher phosphate levels than your test kit shows. Chemically: there are phosphate-based chemicals like sequestering agents that are popular in the pool business to prevent scale and metal stains. Organically: weather like wind and rain can introduce soils and other debris from nature that contain phosphates in them. Think about plants and grass near the pool, and if the yard uses any fertilizers that could be washed into the pool during a heavy rainstorm. How about this, are you in a rural area near farmland? When the wind blows, the fertilizers they use are a huge contributor to phosphates in pools. Another example of this, though rare, is soot from wildfires, which is very rich in phosphorus and nitrogen. Tap water: Water treatment centers have been treating drinking water with phosphate-based sequestering agents. They do so to protect the infrastructure and pipes from scale formation and corrosion. And it’s a good thing they do, by the way. It’s just a problem for swimming pools that we need to be aware of. We strongly suggest testing for phosphates in your tap water to see if this is a factor in your pool. Why should we remove phosphates? So now that we know what phosphates are and where they come from, let’s talk about what they do and why we should remove them from our water. Phosphates are a key nutrient for microorganisms...in particular, algae. According to renown water chemistry expert Richard Falk, phosphates over 500 parts-per-billion can be problematic. The reason? Because phosphates allow for optimal growth and reproduction of microorganisms. Sanitization basically boils down to the growth rate of microorganisms vs. the kill rate of the sanitizer. 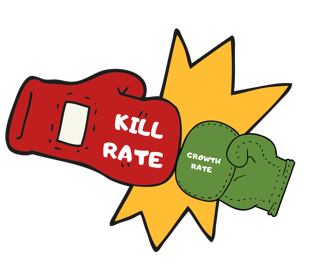 If the growth rate exceeds the kill rate, you can get an outbreak...say, for example, an algae bloom. And when we factor in all the other things that bog down chlorine (like high pH, cyanuric acid, organic waste), slowing down the growth rate becomes very important. In other words, proactive behaviour is to not only try and optimize chlorine's kill rate and ORP, but to also do what we can to slow the growth rate of contaminants like algae. In an ideal world, where we can keep phosphate levels down and sanitizer efficiency up, we should never have an algae outbreak. So regular phosphate removal is an easy practice to adopt if you’re not already doing so. Simply use a phosphate remover as needed. Maybe it’s quarterly for your pool. It could be once a year. Some pools may need phosphate remover every week or every month. It just depends on the pool’s needs, and how frequently phosphates are being introduced to the water. Different products have different instructions. For our PR-10,000, pour the recommended dose (which you can find on the back of the bottle, or better yet, use the Orenda Dosing Calculator App) around the perimeter of the pool. If your phosphate levels are high, you may have fallout that precipitates at the bottom and needs to be vacuumed out. Otherwise, clean your filter after removing phosphates with PR-10,000. With regular phosphate removal, where you keep the levels below 500 parts-per-billion, you may find your chlorine demand is reduced because the growth rate of contaminants has been reduced. Chlorine can stay ahead, and water can stay cleaner as a result. To reiterate, Orenda's Four Pillars are fundamental practices that are proactive and preventative. Removing phosphates alone does not undo an outbreak of algae or anything else. As Richard Falk said, phosphate removers are a good preventative measure, though may not be necessary. If you are able to maintain free chlorine to cyanuric acid ratio (FC:CYA) of 0.075:1 part per million, chlorine should be able to stay ahead of algae. That can be very difficult and impractical to do, especially if your pool is overstabilized. We will cover overstabilization more in Pillar 4. If you cannot maintain that critical 7.5% FC:CYA ratio, using a phosphate remover can help significantly. 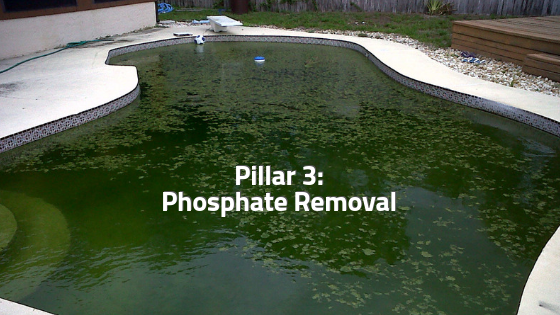 It's the reason we decided that phosphate removal is our third pillar of proactive pool care. Green Pool, Full of Algae, but No Phosphates?